NORTON, Va. – Family and friends of a hospitalized patient might spend considerable time in the room as a way to show their love and support. When a visitor stays for an extended period, Mountain View Regional Medical Center’s auxiliary wants to ensure it is a rewarding and positive experience. So the group’s members sprang into action recently when they learned new chairs were needed for the hospital’s guests. The auxiliary, which considers its work a labor of love, purchased four sleeper chairs for patient rooms. Fred Pelle, the hospital’s president, said the chairs were a welcome gift. The auxiliary uses money it raises through a variety of activities, including sales in the gift shop, to buy new pieces of equipment for the hospital or donate to local nonprofit organizations, such as Mountain Empire Older Citizens. For more information about the Mountain View Regional auxiliary, please call 276-679-9100. Further information about the hospital is available at www.wellmont.org. 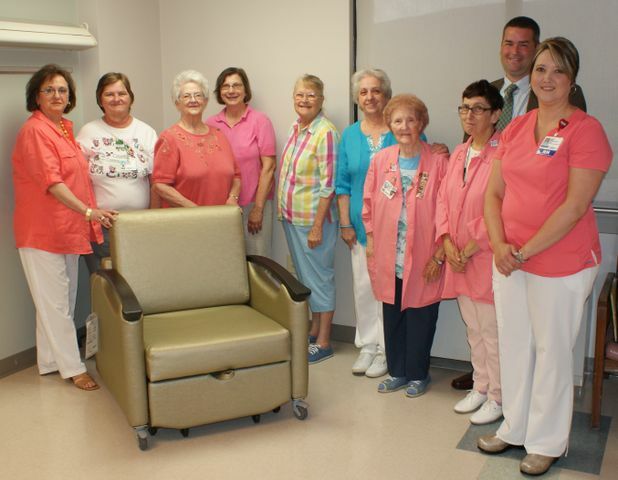 Members of the Mountain View Regional Medical Center auxiliary and hospital staff members stand with one of the chairs that was donated. Pictured, left to right, are auxiliary members Barbara Caruso; Debbie Spurlock; Joanne Kennedy; Debbie Clisso; Gail Williams; Glenda Woody; Eleanor Moore; and Mary Jane Isaac; Matt Tavenner, the hospital's chief administrative officer, and Kim Pennington, clinical manager of the hospital's medical-surgical-pediatrics unit and intensive care unit.